The application period for the current round is open! Apply until the 31st of July 2019! You are a female postdoctoral researcher, female head of a junior research group or a female junior professor? You are a female doctoral candidate in the final stage of your PhD? 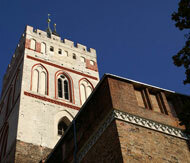 Moreover, you are linked to a university or non-university research institution in the State of Brandenburg? You would like to actively take part in the shaping of your own biography? You would like to plan systematically your next career steps and to prepare for evaluation procedures and application processes? As an international researcher, you would like to gain deeper insights into requirements, conditions, structures and proceedings in the German speaking scientific community? Think about an application for the mentoring and coaching programme for female postdoctoral researchers! strengthens your competent and convincing performance in English and German speaking surroundings. Apply now until July the 31st 2019!